Buy Online Now! 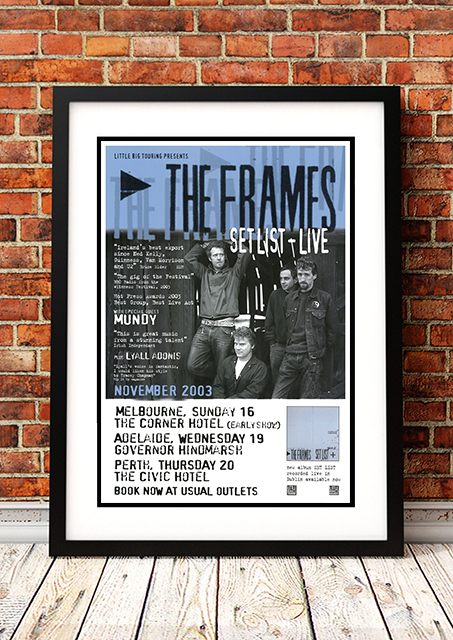 - Frames Rock Concert Posters and Memorabilia. The Frames are an Irish band that formed in 1990. The name The Frames arose from founding member Glen Hansard’s habit of fixing bicycles of his friends.The large number of bicycle frames lying around his house led neighbours to dub it the “house with the frames”. In a 2001 interview, Hansard said, “I worked in a bicycle shop for a little while, but the name came from … my back garden was so full of frames, my house became known as The Frames house, much to my mother’s distaste, she hated it. 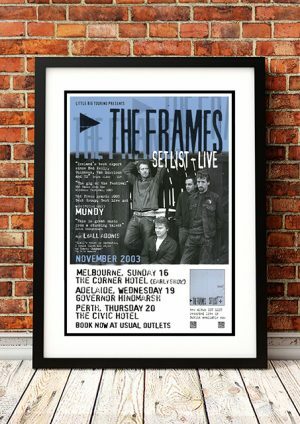 We stock an awesome Frames Concert Poster from their Australian Tour in 2007.